Correction: An earlier version of this article incorrectly described the source of a Structural Blue factory pack and the refinish process for Mazda 46G. The factory pack is sourced from one’s paint supplier, and 46G is generally a quad-coat process, according to PPG. The article has since been corrected to reflect this. 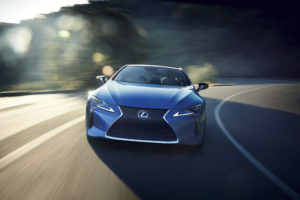 PPG collision segment director of marketing Jennifer Boros on Monday said Lexus’ beautiful Structural Blue color — which required an extensive process to develop and apply on Lexus’ part — in fact isn’t difficult to refinish in the aftermarket at all. “That’s a standard basecoat clearcoat process,” she said. Lexus Europe in 2017 said it refined what had originally taken 40 separate layers down to seven to create Structural Blue (8Y0), which was inspired by the Morpho butterfly’s vivid wings and can be found on the 2019 Lexus LC.Inspiration Series. The butterfly doesn’t actually have any blue on its wing; the light reflected off of its microstructures simply makes our eyes think it does. A single LC in the factory receives 300 grams of pigment and 300 billion pigment flakes, which include nanostructure flakes for iridescence. “Conventional pigment paints reflect less than 50 per cent of incoming light as a visible blue colour, but with Structural Blue the level is nearly 100 per cent,” Lexus wrote. “Not only is the process to create the paint specialized, applying the paint to the LC is such a meticulous task that only two ‘Structural Blue’ LCs can be painted each day,” Bracken said, according to the prepared remarks. But the version of the paint available for the aftermarket makes it easy for the Lexus repairer, according to PPG. “It’s not a difficult repair,” Boros said. An August PPG video demonstrates the procedure, which does require a shop to purchase a factory pack of the paint. Lexus only made 100 Inspiration Series LC 500s with the color. So despite concerns about repairability, the $106,640 special editions aren’t exactly going to be rolling up to every shop on the market. But should one appear at your facility, your paint department should be able to handle it. Boros said the ease of Structural Blue for an aftermarket repairer was likely an anomaly among the new colors being released by OEMs. “We are seeing just more difficult colors,” she said. It can require “multiple coats, multiple layers” to get the effect right in the aftermarket. She said Mazda’s 46G Machine Gray Metallic and its typically quad-coat process was a good example. She also mentioned quad-coat colors for Nissan and Mercedes. Matte finishes experienced a slight dip in popularity but “now it’s back up,” according to Boros. Conversely, mixed gloss levels were also appearing on the market, she said. Tinted clearcoats were another element which could be seen, she said. Boros and PPG colleagues Frank Jemiola, pigments global technical manager; Darin Poston, collision segment application specialist; and John Thomas, PPG automotive OEM color technical manager, will discuss such trends and their repairability at “Current and Future OEM styling trends and the Impact on Refinish” from 3-5 p.m. Tuesday, Oct. 30, during the Society of Collision Repair Specialists’ Repairer Driven Education series at SEMA. Attend the PPG team and other speakers’ sessions by taking advantage of early registration for the Repairer Driven Education series and OEM Collision Repair Technology Summit at SEMA.